A barb at the US - Mexican border. Photo by Cam. 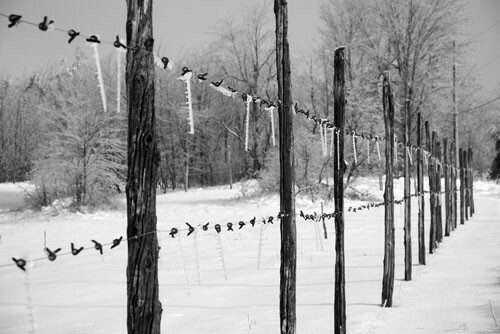 woven into the concept: leave a site untouched, in the state that you found it. Use, but don’t exhaust. Nature belongs to everybody – and nobody. control people coming in or running away from the less powerful nations. Who is granted access and who is not? During a couple of sunny and warm November days with generous help from Carl Lindquist and Susie Osler, the Winter -09 Fieldwork installation Freedom to Roam was set up. The 300 feet long fence follows the road and ends in a soft turn between the trees at the far end of the Fieldwork site. Even though it’s colors at this time of year blends with the surroundings the size of the piece still makes it striking. 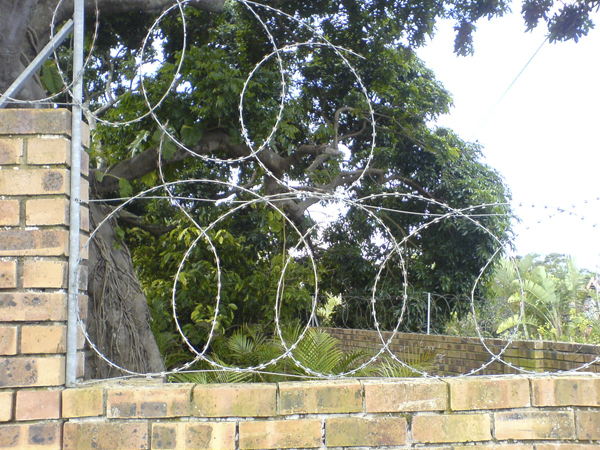 First time I really noticed the beauty and ambiguity of barbed wire was during a trip to South Africa in 2008. Most private property there has high walls with barbed wire coils or electric wire on top surrounding it in order to keep uninvited guests out. The South African crime rate is very high, and in many ways the need to secure your property, house and personal safety feels natural. At the same time it made me think a lot about history – not only the South African situation with apartheid, but also in general about nationality, class, segregation, border control and ownership. When I was asked to participate in Fieldwork it felt natural to make a comment that somehow related to this theme. 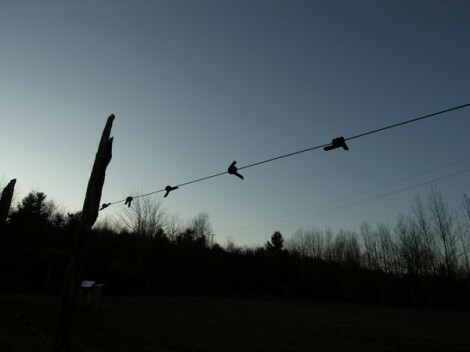 I also found the shape of the wire itself really interesting: how can something so hostile looking at the same time be so beautiful? The clay part of the piece, the actual barbs, enhances that in a very specific way. Being ceramic and there for fragile they can never actually function in the same way as the object they’re representing. That general idea comes back in shaping of the fence. 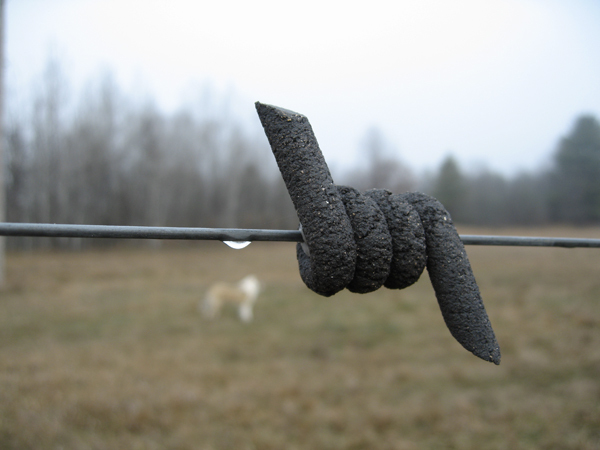 My initial idea was to work with the wire in a kind of roll, resembling the fences used at borders and fronts, but with the more commonly used fence the references can apply to a wider area of ideas related to property and land. It was also easier to exaggerate the size of the installation and, again, reinforce the strangeness of the act of fencing in. What can a ten feet high fence, with the lowest strand at five feet, possibly fence in? No matter how much effort is put in to keeping “others” out there will always be some who succeed in entering or passing through. Lofoten, Norway. Photo: Anton van Genugten. 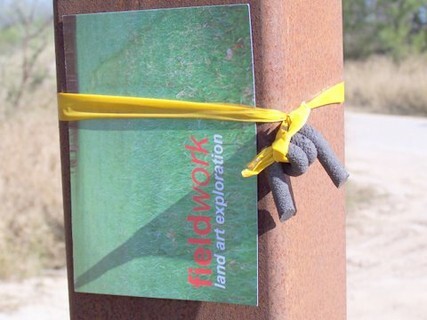 After finishing the installation of Freedom to Roam, I had an interesting conversation with Susie Osler, owner of the FieldWork site land. This was right around hunting time in the area, and Susie did not want any hunters passing through her property. It felt a little bit funny to be installing a piece about the freedom to roam and at the same time use a land owner’s right to deny trespassing. The whole situation made me think about what kind of “use” of land that feels just to me, and what not. If I had owned land I would definitely not want any hunting to be done there either, simply because I don’t hunt myself and don’t want to risk my life walking around in the woods…. After some feed back from people living on, or close to Old Brooke Road, I became aware of a local land related conflict of a kind that I, strangely enough, hadn’t even considered when the idea for this piece came up. It’s a conflict about power and control, about brave and persistent individuals fighting against authorities and big businesses to prevent exploitation of land. In this local case it’s about a uranium mining threat close by, but on a global basis this is of course a huge deal. 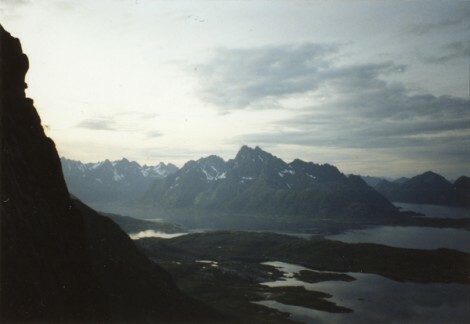 In Norway, for example, the area of Lofoten on the northern coast holds the last unexploited oil field in the country. The awareness of oil peak seems to not have been very high in Norway up until recently, but as it’s considered that their current oil fields will be empty in only ten years from now many people are waking up from their state of “petromania” and are now facing the decision of either opening up for oil drilling in the Lofoten archipelago to keep the national economy on the same high level it has been on since the seventies, or to let this wild and beautiful area remain untouched. I would like to say thank you- so much- to every one who has given me feedback on this project. I am so happy that it seems like the piece has really been able to be trigger some thoughts. More comments are very welcome.